You may have heard the phrase “Build a House with a Good Hat and Good Boots.” It means pay attention to your roof and your foundation. These two areas are very important; however, because they are relatively boring in the grand scheme of things, they often get less attention than they should. 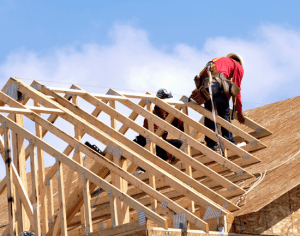 People building a house often like to spend time thinking about their amazing new kitchen or their fancy master suite, not their roof and how it’s built. The catch is that how your roof is built is perhaps one of the most important details in the entire project. Why? There are several reasons. Here are a few. Insulation Value. 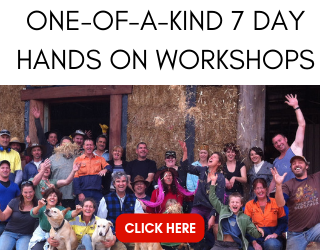 Everyone talks about how amazing straw bale houses are for creating a super insulated home. That’s true, but only as true as the roof is insulated. I think it was grammar school where I learned that heat rises. That law of physics is still true today and if your roof is not properly insulated, that law will ruin your super insulated home. There’s simply no point in building a house with R-40+ walls and an R-30 (code for vaulted ceilings) roof. Over insulate whenever you can. I find that two layers of R-21 insulation fit perfectly into a cavity created by 2×12 framing or 11 7/8” engineered lumber. Those are the two most common rafter sizes in vaults, so there’s no reason you should not have at least an R-42 roof. If you are using trusses, the insulation can be even higher. Strength. As I mentioned above, the most common rafter size these days is 2×12 framing or 11 7/8” engineered lumber (BCIs or TJIs). Don’t skimp on design or implementation here. I remember reading an article several years ago about a man who was killed when his “straw bale house collapsed” (according to the newspaper). When I read further, I saw that the straw bales had, in fact, not collapsed nor had they caused any damage to the house. Instead, a large snow load had caused his under-sized rafters to collapse under the weight of the wet snow. A tragedy for sure, and one that could have been avoided if the rafters were sized properly. Protection. The roof obviously does a great job of protecting you during weather; however, the protection I’m talking about is more about proper passive heating and cooling design. Be sure to take the time to properly design the roof overhang to provide the proper shading and solar gain for your latitude. Every site is different as is every design (I hope), so it’s really important to take in account all of the factors you have on hand. For example, site slope, latitude, potential shading from neighboring structures or landscapes, standard weather patterns for the area, and so on. The more data you can amass, the better. Slope. The slope of the roof can impact many aspects of the home. The steeper the roof slope the quicker an overhang will encroach on window views as it is extended, the faster water and snow will slide off of the structure, and the less practical roof repairs will become. If the roof slope is too low, water and snow will build up and won’t drain away quickly. This can cause leaks and damage may occur to the house. A medium sloped roof may be the perfect choice not only for the above details, but also for the inclusion of solar panels to power the house and heat the water. As always, the exact slope will depend on the design and the natural impacts of the site. Overall Design. The more complicated your roof design, the more expensive it will be to build. It’s hard enough to build a good roof with even the simplest design. If you add lots of valleys and hips (intersections of other roof lines, etc…) things get complicated quickly. After all, the roof is built up in the air. That’s not easy to do. Then once framed, the complications continue when t comes time to flash and waterproof it. Finally, the installation of the finish material itself is also complicated. What you use for the finish material can also have a large impact on the functionality of the roof. Standard asphalt shingles don’t make a good surface for water collection, metal roofing (although great for water collection) can reflect the sun and heat into neighbor’s properties, natural materials like slate have pros and cons as do the recycled “fake” counterparts. Check out all the details before you make a decision. Also, don’t look only at sticker price. Consider the lifecycle cost of the material. If a metal roof will last you 50-150 years, will provide water collection, and will reflect heat away from the home, then perhaps the added sticker costs are worth it. This is just a sampling of the things I encourage you to consider when thinking about and/or designing your roof. There may be other site-specific things I have not listed and those are always important to pay attention to. You can learn all about framing in our comprehensive How-To Video Series. 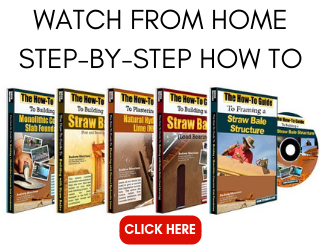 It contains over 10.5 hours of top-notch, professional quality instruction on everything from foundations, to framing, to baling (post and beam and load bearing), to plaster. You even get a FREE set of the Mountain View Cabin construction plans with your purchase. All for only $40 and it’s delivered instantly to your inbox. There are many other factors while making a home we can consider but you picked some important one and describe it very well. You are certainly right that there are many other things to consider. Let´s call this a jumping off point. Thanks for your feedback. Hi Andrew, i hope you can answer this. 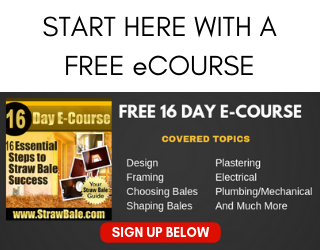 I have been trying to find out if it is an acceptable practice to apply CC spray foam directly onto bales. We are thinking to use it in the tightest space of the triangular space created between the top of top course of bales and the underside of the unvented cathedral ceiling assembly. We plan to stuff the rest of the cavity with straw. It’s a post and beam frame supporting the roof. PS…just met with our Slovenian friends from the Claverack NY workshop. I think that would be fine. I have used foam in smaller applications directly on the bales (we are talking about an expansive foam right?). It fully adheres to the straw, actually incorporating some of the straw into the expanded foam. Should be fine.